I've been coloring my hair since forever. I don't know why, but I find my super black hair boring. Sorry na. Maybe one day I'll learn to appreciate it. But for now, I'm okay with colored hair! Choosing a hair color could be quite a challenge, especially for morenas like me. I don't really veer away from reds. It's my tried and tested shade. I have tried ash blonde and another color that is more yellowish brown (basta yun! haha), but I always comes back to red. Two weeks ago, I had my hair colored again at VIVERE Salon and I loved the result! Went there late on a Sunday. Wala mashadong tao yey! My hair. It's not even na! My hairstylist that day, Sir Joel! My hair was divided into sections and then the color was applied. It's so orangeyyyy. But don't panic! That's normal. Hehe. After 20+ minutes of waiting, time to wash the dye off! He also trimmed my bangs! Yey! When struck by sunlight. Loveeee. Good news!!! They have an ongoing promo! 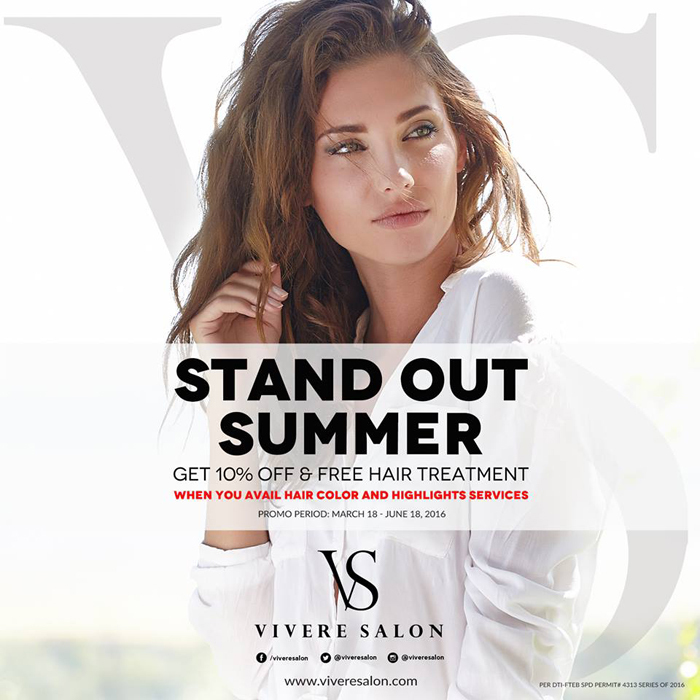 Get 10% discount on hair color and highlights services plus a FREE treatment until June 16! So, go na to Vivere if you want a hair makeover or if you want to up your hair game! If you're going to Trinoma, look for Joel. You won't be disappointed! :) Have a great hair day, guys! I want to get my.hair.ash gray kaya ba nila yun and.How much magpakulay sa kanila?